We are able to offer a cost effective service to our customers. We can easily adapt to individual needs. Whether you are requiring a breakdown recovery in Bolton to anywhere in the British Isles or a short transportation of a none runner from Preston to Chorley. 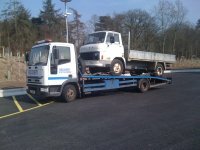 We are experienced in all kinds of recovery and vehicle transportation. We can handle all your needs from a flat battery or tyre change to accident recovery. We also offer a range of garage services. We can perform tasks from simple replacement bulbs up to engine rebuilds and fitting. Along with a fully equipped tyre bay. We aim to offer a value for money service, that is tailored to the customers needs. Many of our commercial customers have been repeat users of our service or recommend us to others. There are no hidden extras and quotes are available prior to any action being undertaken. We at AFB AUTOMOTIVE are committed to customer service. In the event of a breakdown requiring Immediate recovery please ring our mobile number - 07876032562. This is manned 24hrs a day. In the case where you need a vehicle transporting then either email us through the contact page or ring for a no obligation quote.